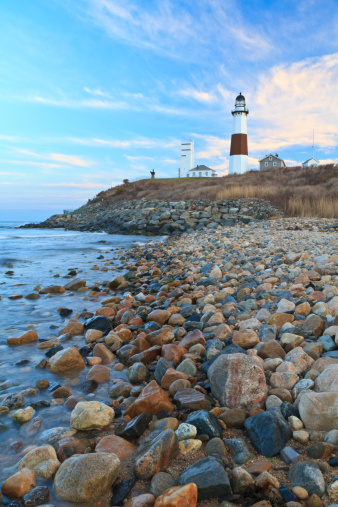 Located on the East End of Long Island, Montauk Village has a rich history. Legends abound about Montauk Village, from Captain Kidd’s buried treasure to government time-travel experiments in the 1970s. Whether the stories are true will probably never be revealed. Even without the folklore, Montauk’s past is riddled with interesting events and personalities. The birth of Montauk Village: European settlers came to Long Island in the 1600s, and they found that the island was ruled by the Montauk Sacham and was home to several nomadic tribal factions of Algonquin Indians. The Montauk Indians lived on the Island’s natural resources of plants, fish, deer, and birds, and they also farmed crops of corn, beans, and squash. Wyandanch, leader of the Montauk, allowed settlers to raise cattle in Montauk Village, as well. The amicable tribe also taught European settlers how to hunt whale, and whaling became the primary industry for Montauk residents through the 1800s. In 1686, Wyandanch sold Montauk Village to East Hampton settlers, who owned the village for about 200 years. During this time, Montauk became a hub for cattle events, including summer pasturing and yearly cattle drives. In 1797, Pres. George Washington commissioned building of the Montauk Lighthouse on the East Coast to alert sailors of the rocky shoals extending from Montauk Point. The lighthouse and two other buildings were the only structures in Montauk until the late 1800s. Montauk’s Evolution: Just after the turn of the 20th Century, wealthy families invested in summer homes in Montauk Village, and led by businessman Carl Fisher, Montauk residents looked forward to the town’s becoming the Miami Beach of the North. When the stock market crashed in 1929, the dream fizzled, but Montauk survived. In fact, since the 1930s, Montauk has developed a reputation as a popular summer vacation destination. Today, shopping, dining, and entertainment venues, and gorgeous beaches keep tourists coming back year after year. Perhaps it’s the magic of Montauk that makes this village the perfect setting for Dr. Gross’ Montauk Tango. After all, Dr. Gross isn’t the first wordsmith to fall victim to Montauk’s seduction. This entry was posted in Montauk and tagged best restaurant in Montauk, history of montauk, montauk books, montauk history, montauk indians, montauk lighthouse, montauk ny, writers on montauk. Bookmark the permalink.